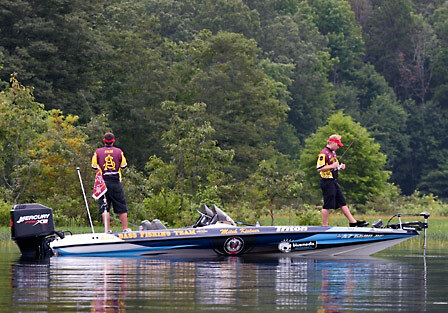 LUCKY 13 -- After Day 2 of the Under Armour ESPNU National Collegiate Bass Fishing Championship, the ASU Bass Fishing Team placed 13th out of the 54 competing teams. The next stop for the Devils is the FOX College Sports Collegiate Championship at Lake Lewisville, Texas, in September. As most of you know, the Under Armour ESPNU National Collegiate Bass Fishing Championship was held July 9-10 on Lake Maumelle, in Little Rock, Ark. The tournament consisted of a three-day event, with the full field 54 colleges/universities) competing on Days 1 and 2 and the top five competing on Mystery Lake on Day 3. After Day 1, the ASU Team — composed of Mike Eyler and me — weighed in 4 fish for 4.05 pounds. After four days of pre-fishing, we were feeling pretty good about Day 1, as we had drawn boat 3 for the launch. All through practice we had targeted fish in 18-25 feet of water under the bluebird conditions and caught some up shallow against the weedline in the mornings. Unfortunately for us, a thunderstorm rolled through on Day 1, turning on all the fish that were up shallow in the afternoon and for the teams who were struggling fishing deep so they fished the weed line. This let a lot of teams who had struggled in practice to weigh in fish that day. After the Day 1 results were finalized, we were sitting in 21st place going into Day 2. Day 2 brought the bluebird skies we had practiced for, and our spots continued to hold fish, as many other deep-structured spots got burned up on Day 1. Mike and I had managed to lock down enough spots in practice not to run out of fish for Day 2. Although, we had trouble finding kicker fish both days, we were one of only six teams to bring in a limit on Day 2 weighing 5.31 pounds. After Days 1 and 2 were finalized, ASU finished in 13th place of 54! On behalf of the ASU Bass Fishing Team, I would like to thank all of you who made competing in this tournament possible, and thank all of you for your support. Our next focus will be sending two teams to Lake Lewisville, Texas, in September for the FOX College Sports Collegiate Championship. We will be sending two teams, one composed of Craig Carroll and me and a second team made up of Brent Perkins and Mike Eyler. Here are some links to pictures on the EPSNU College Bass Web site of Mike and me during the tournament. Also, you can always go to www.PhotoBucket.com login: ASUBFT pw: swimbait and check out pictures of the team, which is updated regularly. Thanks again for all of the support. Go, Devils!